Looking for a protein-filled appetizer that everyone will devour? 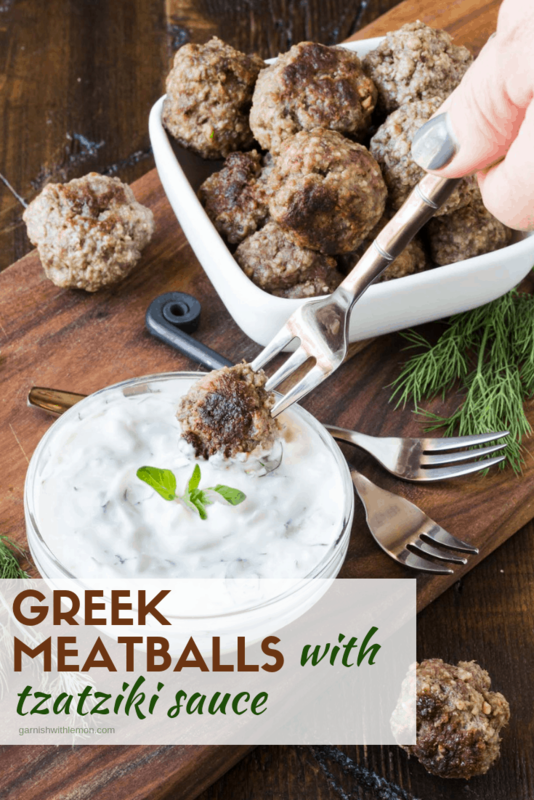 These Greek Meatballs with Tzatziki Sauce are a tasty addition to any party spread! It’s December, which means invitations to social gatherings are abundant, and I’m never one to miss out on a party. And it just so happens to include a lot of one of my favorite food groups….dairy! 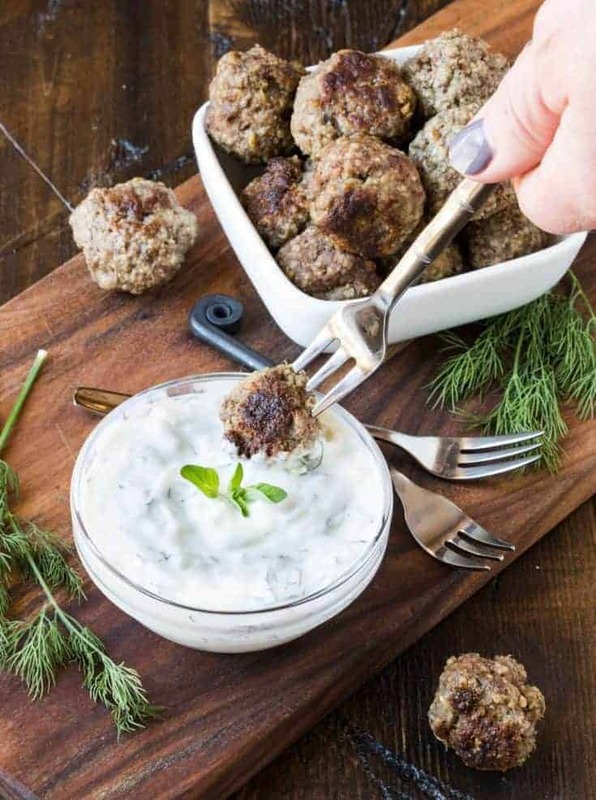 But for my Potluck dish, I took a break from the oozy, gooey cheese that I love so much (like in this Warm Gruyere and Caramelized Onion Dip) to share a healthier appetizer with you: Greek Meatballs with Tzatziki Sauce. Greek yogurt is a great way to help you make smart eating choices during the holidays without sacrificing that rich flavor we all crave. 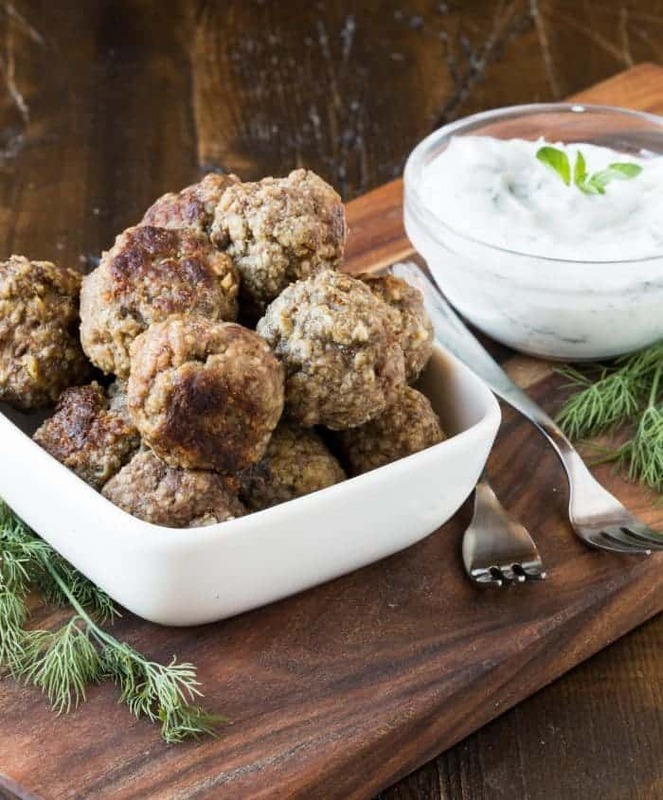 High in protein, Greek yogurt keeps you fuller longer and also makes this Tzatziki Sauce super creamy with just a bit of tang, a perfect partner for the Greek Meatballs. Pop it all in your mouth with a pita bite, and you have yourself a mini gyro. Heavenly! I love having healthier appetizer options like these at parties because they help me control my portions. Life is all about moderation, but it’s even more important around the holidays. Here in Minnesota, we have almost 4000 dairy farms and are the 7th largest milk-producing state in the country. Our farmers, along with dairy farmers in Ohio and across the country, want to make sure everyone can enjoy a healthy meal this holiday season. Check out more recipes on the ADA Mideast Facebook page! Thanks to the ADA Mideast for sponsoring this post. All opinions are my own. Looking for a protein-filled appetizer that everyone will devour? These Greek Meatballs with Tzatziki Sauce are a great addition to any party spread. Preheat the oven to 450 degrees F. Place a cooling rack over a baking sheet for roasting the meatballs. Pour the olive oil into a medium bowl, then add the meat and season with salt and pepper. Add the bread crumbs and 2 tablespoons of milk and mix to combine. (Add additional milk, tablespoon by tablespoon, if needed to moisten meat mixture.) Add the red pepper flakes, oregano, cinnamon, 2 of the garlic cloves, egg and 1/2 of the lemon juice, and mix to combine. Using a small cookie scoop, form the meat mixture into about 30 balls and place on the rack on the baking sheet. Roast until golden brown, about 15 to 18 minutes. Peel the cucumber and grate it into a strainer. Salt it and let it drain for 20 minutes. Squeeze the cucumber in the strainer to get out the excess water and add to a food processor. Then add the yogurt, dill, remaining 1 clove garlic, and remaining lemon juice. Season to taste with salt and pepper and process until smooth. Serve with pita wedges, if desired. I saw this on G+ and had to come over for a look. What a great idea. Pinning this one, I’ve never made Tzatzike sauce, but that’s going to change soon. Thanks for this post. Thanks Lea Ann! It’s really easy to make and Oh, so good! Thanks for stopping by! Hi, I’m back. I was just looking at the recipe because I want to take these to a party tomorrow. In the ingredients, you have 2 Tablespoons (plus additional if necessary). I went down to the instructions to find it was milk. You may want to change add the word milk in the ingredients. Hi Judy, When I serve these Greek Meatballs, I serve the sauce cold or room temperature. Hope that helps!